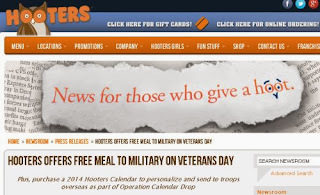 Free Meal to Military on Veteran's day 2013 @ Hooters. Just click the link below to get the details & to find the nearest location to your area. Thanks you to our great Military for your service! Happy Veteran's Day 2013!